Nestled in a pleasant valley surrounded by hills and mountains, Tecate is a charming small city with one non-commercial port of entry. This friendly community is known for the production of Tecate beer and the world famous Rancho La Puerta Spa. Though peaceful and relaxed, Tecate has all the resources that support over 100 manufacturing operations for international companies such as Taylor Guitars, Teleflex and Broan-NuTone. 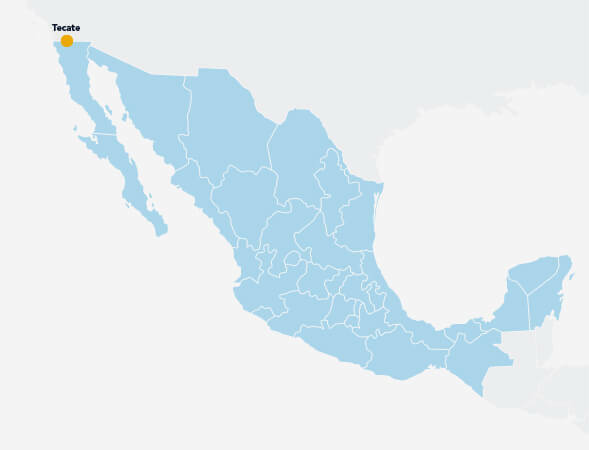 Ensenada, Mexico – 81 mi. Long Beach, CA – 157 mi.